Though quick and easy to cook, this Indian dessert is very tasty and also hugely popular. It's perfect to make when time is short but you still want a special dessert. These ladoos can also be prepared on the occasion of any festival. 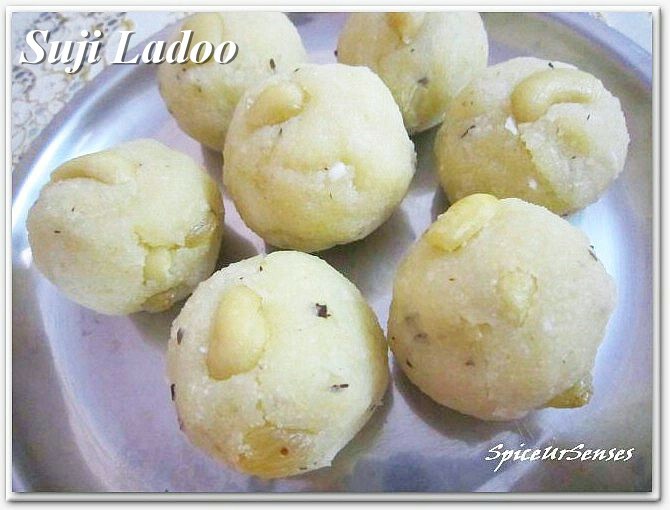 These ladoos are very delicious and can be stored for even 15 to 20 days. Heat a deep pan on a medium flame and when hot add the ghee. When it melts, add the cashews, almond and rasins and fry for 2-3 minutes. Drain with a slotted spoon and remove onto paper towels. Keep aside for later. In the same ghee, add the Sooji and mix well. Roast the Sooji (stirring frequently) till it begins to turn a very light golden color and give off a faint aroma. Add the sugar and mix well. Now gently add the milk, stirring all the while to prevent lumps from forming. If any do form, make sure to break them with the back of the stirring spoon so you get a smooth paste-like consistency. Cook the mixture till it is thick and begins to come away from the sides of the pan. Add the dry fruits and dry coconut now and mix well. Turn off the fire and allow the mixture to cool till you are able to comfortably handle it. Now form the mixture, a little at a time, into lime-sized balls (Laddoos). Press gently but firmly with lightly greased palms to ensure they have no cracks and are firm and smooth. Arrange the Laddoos on a lightly greased platter as you prepare. The Laddoos will become firmer if left alone for approximately half an hour. They are now ready to serve or store for later. Keep in an airtight container for upto 1 week. Great combo and looks yummy! Sounds delicious!!! Looks fabulous & it is so easy to make. Easy preparation and so delicious recipe. Yummy and iviting laddos..all time fav. Inviting and yum yum ladoos. Hi... First time in ur blog... U have a nice set of recipes. All looking good. This soji laddu is my all time fav. YUM! Love these anytime.Your ladoos look so yum. wow this is a perfect treat!my kids will surelly love this. looks so adorable. wonderful and delicious ladoo !! Feel like gobbing some,fantastic laddoos..
ah my fav kind of ladoos - look super yummy! Simple and quick dessert. Looks simply good ! They look lovely and delicious. bookmarked. I have all the ingrediendts except Suji, I have never even heard about it, will look it up :-). It's always good to learn about new ingredients! Diabetic Recipes Oats Cheese Cake With Britannia Nutrichoice Oats Cookies. Copyright © Spice Ur Senses. All rights reserved.